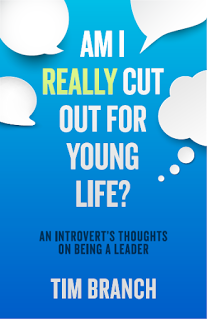 The Young Life Leader Blog: Should Introverts Be Young Life Leaders? Should Introverts Be Young Life Leaders? We don’t always love the spotlight. We don’t always love meeting new people. We’re more comfortable being introduced at parties. And half the time, we’re a lot more comfortable holed up in our room with a book than killing it in the middle of the dance circle after Young Life club. So what does that mean about us? Does it mean we won’t ever make great Young Life leaders? If you’re feeling insecure about your ministry for any reason, you’ve probably asked yourself this question recently. So let’s answer it: Can introverts actually make good Young Life leaders? You bet they can. And not only that—they’re a necessary part of any healthy Young Life team. Here’s why: High schoolers come in all shapes, sizes, and types. That means high schoolers need leaders of all shapes, sizes, and types. Take a second to imagine your Young Life club. What kinds of kids do you see? Are there crazy, outgoing, wild kids there? Probably. Are there kids who stand next to the crazy, outgoing, wild kids, who don’t have quite as much energy? Yep. Now look over at the wall. Are there some quiet kids leaning on the wall back there who don’t feel comfortable in this high-energy social situation? Those kids need a leader who understands them. Someone who won’t overwhelm them. Who do you think is going to connect best with them? As an introvert, I found I connected with these kids almost instantly. And actually, I experienced a renewed sense of passion and excitement for Young Life after I started pursuing them. Having a person who can connect with the quieter kids at club is incredibly beneficial for the team. One of the things we always strive for in Young Life is having a club that looks like the school. And in order to truly connect with every type of hurting high school kid, teams need a diverse group of leaders with a diverse group of gifts. So are introverts good Young Life leaders? Being introverted gives you the ability to connect with certain people in a way extroverts can’t. Just like extroverts can connect more deeply with a whole different group of people. I wish I had known this when I first started leading. That’s why I wrote this 27-page eBook for people who don’t feel like their ministry fits the mold. It’s called Am I Really Cut Out for Young Life? An Introvert’s Thoughts on Being a Leader, and you can download it for free right here. If you’re feeling insecure about your ministry, or you know someone who is, check it out and pass it on. I wrote it because I’ve seen too many amazing people with so much to give quit leading because they didn’t feel like they were right for ministry. When the truth is, they’re perfect for it. Encourage an introverted leader today. The team will be stronger for it.